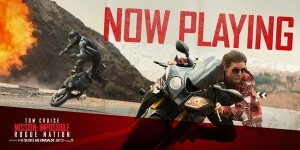 Mission Impossible - Rogue Nation for Kids? 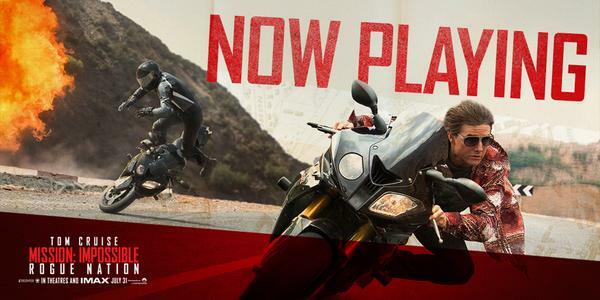 Home » Activities » Movie Reviews » Mission Impossible – Rogue Nation for Kids? Mission Impossible – Rogue Nation for Kids? I broke two rules last night. First, I never go to see a blockbuster movie on an opening weekend. I’ve spent too many Friday nights sitting in the front row just to get silly bragging rights about seeing a first run movie. It’s just not worth it. However, my wife convinced me to make an exception to make a family outing of it. And if pitched that way, it’s hard for me to refuse. Luckily, with a bit of planning (including fake deadlines) we were there early enough to get good seats and wait patiently for 30 minutes for the movie to start. The second rule though is the one I felt worse about breaking. I try to follow Commonsense Media rules, especially when it comes to violent content for my kids. My son is 11, and I’m aware that certain scenes still make him queasy. And there are certain horrible things that human beings do that he really doesn’t need to know about even if all of his pals have been watching people break bones and mutilate other people since the kids were 6. Based on the family appeal, I broke down on Mission Impossible because other Commonsense users had said that it was fine for 11-year olds, and sadly, the family pressure was just too strong. Everyone has been wanting to see this movie. So, the bottom line, after all my inner turmoil. It’s an okay movie for 11 year olds. It has tons of action, including fight scenes and car chases and also the threat of a massive terrorist bomb in a crowded restaurant. However, it’s not any more violent than the odd X-Men or Guardians of the Galaxy. There is two scenes that dads should know about. At the start of the movie, a minor character is shot in the head, which was disturbing. Worse though, was the scene in which a tied-up Ethan Hunt is about to be tortured by someone referred to as the “bone doctor.” They show the case of implements that they will use to get him to talk. Luckily, the escape is hatched before we see the glinty eye of the sadistic torturer as he pulls out his tools. Stuff like that also gives me the creeps. There is one more scene that refers to the Bone Doctor, but that’s it for much other than cartoonish violence (though we do see a knife go into a bad guy’s chest as well). The movie itself is a bit of a mess. The scriptwriter just kept throwing in details and unbelievable scenarios I guess because he knew we didn’t come to be intellectually challenged. We just wanted to watch stuff blow up and bodies collide, “almost” dying each time. Alas, that is a big comedown from the more intelligently produced (but more inappropriate for 11 year olds) Mission Impossible of yore. This time, Tom Terrific, didn’t get much of a chance to flash that famous smile (no, the other one; the human one that shows real connection). The addition of Alec Baldwin was also a waste. Writer/Director Christopher McQuarrie should have reached out to Tina Fey to understand how much comic charm you can get out of this guy before he directed him into a role of a CIA bureaucrat. Jeremy Renner and Simon Pegg also looked to be just going through the motions. So I broke two of my rules, but at least I can write this review, as lousy as it is, the weekend the movie came out, rather than waiting until 90% of humanity has already seen it.